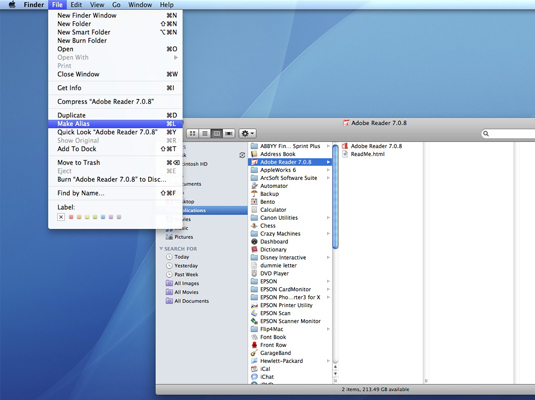 Click Make Alias on the Finder menu. Click the Action button on the Finder toolbar and then click Make Alias. Hold down Control while clicking the selected item and then choose Make Alias from the contextual menu that appears. Hold down the Command+Option key combination and drag the item to the location where you want the alias. Although Mac Snow Leopard does a great job of tracking the movements of an original and updating an alias, some actions can break the link. For example, if you delete the original, the alias is left wandering in search of a home. However, all is not lost; when you double-click a broken alias, Mac OS X offers to help you fix the alias. This involves browsing through your system to locate a new original.